This week from April 11-13th, join Buddhist teacher Tserng Paldron for a series of insightful talks. See schedule below. 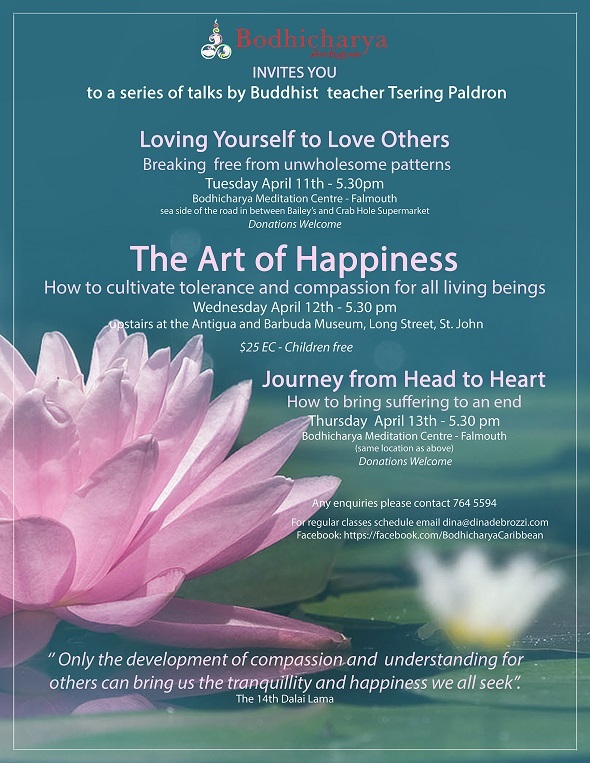 Tuesday, April 11th: "Loving Yourself to Love Others"
Wednesday, April 12th: "The Art of Happiness"
Thursday, April 13th: "Journey from Head to Heart"
Tuesday and Thursday's talks are at the Bodchicharya Meditation Centre in Falmouth Harbour and Wednesday's Talk at the Museum of Antigua & Barbuda. Each talk starts at 5:30 pm each day. For more information; please click event flyer here, email: dina@dinadebrozzi.com or call Dina at 764-5594.